I spied a woman posting these fliers this afternoon and figured why not pass it along? 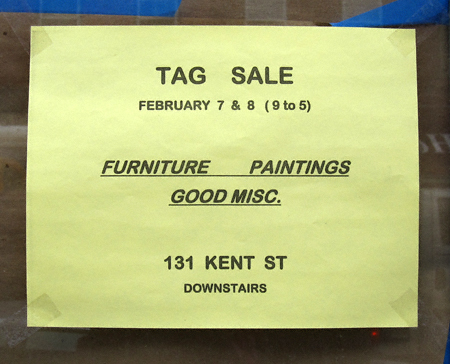 It has been my experience that the stoop (or in this case tag) sales on Kent Street have pretty good pickings. So if you’re in the market for furniture, paintings or “good misc.” (presumably on the cheap) check this one out! Saturday, February 7 & Sunday, February 8, 9:00 a.m. – 5:00 p.m.